What Is An Ariel Atom? So, what is an Ariel Atom? It’s a hand-built, hand-welded, chassis, made of space-tubular-frame for strength and to maintain incredible lightness. It was designed and built in England initially and it was built to perform against the top exotic, super-cars in the world. In order to do that, Ariel had to place all their focus on performance and none of it on accessories. The Ariel Atom will out-brake, out-handle, out-accelerate any vehicle on the road. It’s ridiculously fast, doing 0 to 60 in about 2.8 seconds. It handles corners like a slot car. It’s just an awesome vehicle. The first thing that really appealed to me was that it was like a sport bike with 4 wheels — but even better than a sport bike! 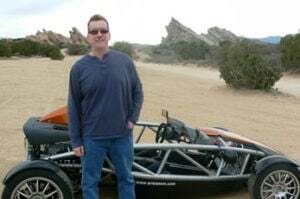 Most people don’t know the name Ariel Atom and I get asked a lot if it is a kit car. There’s no short answer to this. In the past, Ariel was making motorcycles, the most famous being the Ariel Square 4, which, in its day was far ahead of its time. So, it’s the same company. Ariel built the Atom at their factory in England. Here in the United States, I purchased my Atom as a kit from a company named Brammo Motor Sports in Oregon that was making the kit under license. Brammo welded the chassis I had the assembly work also done in Oregon. So, basically it’s a kit car but it was assembled by a separate company. Brammo unfortunately are no longer in the Ariel Atom business, preferring instead to focus on their electric motorcycle called Enertia. The production of the Ariel Atom in the USA has been taken over by a company called TMI in Virginia. (More on TMI later). The tubular chassis is immensely strong, yet beautiful — a great example of fine form following fine function. Three different engines have become available. Mine has a GM Ecotec engine lifted from a Saturn Cobalt. A super-charger added makes it a 300 horsepower engine. The basic body pan attached underneath serves as the place for the seats. In my case, I have two adjustable seats for greater comfort. Everything else is track quality. I have track quality shock absorbers, brakes, etc. Everything is built to a very high spec. The Atom qualifies as a super car because it out-accelerates basically anything else on four wheels. Only the Bugatti Veyron can out-accelerate the Atom by 1/10th of a second — and the Veyron is a $2 million sports car. The light weight combined with high power means the Atom is phenomenal in acceleration and cornering. It’s driving as driving should be. There’s no power steering, no body-work no air-conditioning, no stereo, no doors… All those accessories make super cars incredibly expensive. So, yes it’s wonderful to have an Aston Martin Vanquish, but what you’re paying for is the technology necessary to have those accessories and make them work properly. The Atom has none, which is why it’s an affordable super car. The Ariel Atom is built for the track. However, it qualifies as an SPCNS vehicle in California. The reason being is it’s a kit car that you have to assemble yourself or have assembled for you. If it didn’t qualify as SPCNS then it would be considered a passenger vehicle and therefore would have to comply with regular passenger vehicle regulations for things like windshields, fenders, etc. So, buying it as a kit and assembling it means thankfully (at least in California) it can be made street legal fairly easily. What does that mean for the person who buys it? It means that when you buy it, it’s not street legal, but with a little effort you can get it street legal through SPCNS regulations. I can’t say that for certain that it would be street legal in all the States, but certainly it is in California. It’s a bit of a process, it takes about 3 months. There is a procedure you have to go through at the DMV (see legal). My Atom is now fully street legal in California. I love talking about the Ariel Atom, so feel free to ask me any questions. Don’t forget to visit my blog on the Atom.